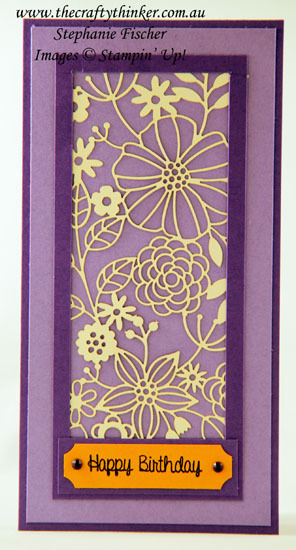 The new Delightfully Detailed Laser Cut paper is so beautiful that a card doesn't need much else! This is such a simple yet effective card! I simply chopped off a piece of the Delightfully Detailed Laser Cut paper that comes in a 12" sheet and glued it behind a frame of Gorgeous Grape cardstock - #loveitchopit . In this instance, I used the Very Vanilla side of the laser cut sheet (the other side is Whisper White). The base card is Gorgeous Grape with a layer of Highland heather. The greeting is from the Hand Delivered stamp set which is a Host set in the new Annual Catalogue and available, with a qualifying party/workshop, from 1 June. It's stamped onto a small offcut of Mango Melody card from which I trimmed the corners with a 1/2" Circle punch. This is mounted onto an offcut of Gorgeous Grape and finished with a couple of Blackberry Bliss Faceted Dots - also available from 1 June in the new Annual Catalogue.